Port Moresby (147.160E 9.469S) is the capital of Papua New Guinea, an Australian territory that was virtually undeveloped and largely unexplored in 1941. It was a small, primitive port on landlocked Fairfax Harbor, shallow and suitable only for light traffic, with only a single berthing. The population was about 2600 persons, of whom 800 were Europeans. Bomber airfields were already under construction at the start of the war, as this was to be an important link in the air ferry route from the United States to the Philippines. Only Kila Kila, three miles east of the port, was operational at the time war broke out, and antiaircraft defenses consisted of just a handful of 3" antiaircraft guns and a few machine guns. There was some copra, rubber, and coffee production in the area, and gold and copper were mined in the nearby Owen Stanley range, at Wau and other localities. When war broke out, the port was protected by two obsolete coastal guns on Ela Hill covering Basilisk Passage, the entrance to the harbor. 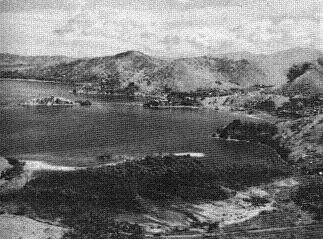 The garrison consisted of the Papuan Infantry Battalion and 49 Battalion, both of which were militia, and there were 12 PBY Catalinas of 11 and 20 Squadron based on the harbor. Ships in harbor included light cruiser Adelaide, transport Katoomba (6775 gross register tons, 15 knots), and a pair of cargo ships. Because of its strategic location, which allowed heavy bombers to stage through Port Moresby to attack Rabaul, Port Moresby was the objective of two Japanese operations during the war. The first was an attempted seaborne invasion that led to the Battle of the Coral Sea, in which the Japanese were forced to turn back. The second was the Kokoda campaign, which came close to achieving its objective before the Guadalcanal landings prompted the Japanese to divert their best efforts elsewhere. Eventually the airbase complex included Kila Kila (147.20E 9.50S); Seven Mile airfield (Jackson: 147.22E 9.44S), which was completed shortly after war broke out; Five Mile airfield (Ward: 147.19E 9.44S), with two 6000' (1830m) surfaced runways; Twelve Mile airfield (Berry: 147.24E 9.41S), completed in May 1942 with a 4500' (1370m) packed gravel runway; Fourteen Mile airfield (Schwimmer: 147.24E 9.40S), with a 5300' (1620m) dirt runway surfaced with Marston mat; and Seventeen Mile airfield (Durand: 147.19E 9.36S), completed near a swamp in which airmen allegedly killed a 26' (8m) snake. There was even a Thirty Mile Airfield (Rogers: 146.895E 9.044S) used for dispersal and emergency landings. Each field was originally named for its distance from Port Moresby, but because of the potential for confusion the fields were renamed on 10 November 1942 in honor of airmen lost in combat.